With a stay at South Bay Inn & Suites in Myrtle Beach (Downtown Myrtle Beach), you'll be steps from Myrtle Beach Boardwalk and 10 minutes by foot from SkyWheel Myrtle Beach. 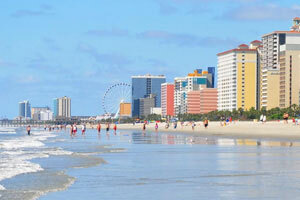 This beach hotel is 0.7 mi (1.1 km) from Family Kingdom Amusement Park and 0.6 mi (0.9 km) from Myrtle Beach Room Escape. Make yourself at home in one of the 242 guestrooms. Complimentary wireless Internet access is available to keep you connected. Bathrooms have bathtubs or showers and complimentary toiletries. Conveniences include blackout drapes/curtains, as well as phones with free local calls. Dip into one of the 3 spa tubs or enjoy other recreational amenities including a complimentary water park and a lazy river. This Art Deco hotel also features complimentary wireless Internet access, concierge services, and a television in a common area. Enjoy a meal at CAPTAIN B"S or snacks in the coffee shop/café. The hotel also offers room service (during limited hours). Quench your thirst with your favorite drink at the bar/lounge. Buffet breakfasts are available daily from 7:00 AM to 10:00 AM for a fee.